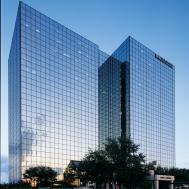 9400 North Central Expressway is a 392,457 square foot, 16-story Class A office tower that sits on more than five acres in one of the most desirable areas of Dallas. The building offers excellent accessibility and visibility along the east side of Central Expressway, between Park Lane and Walnut Hill Lane. It is in close proximity to two Dart Rail Stations, Presbyterian Hospital, North Park Mall, as well as numerous hotels and restaurants. Available suites range from 600 square feet to entire floors. The lobbies and corridors have been recently renovated, and amenities include on-site property management, 24-hour security personnel, a full service deli, car wash and shoe shine service, and a building conference center. Overnight drop boxes and an ATM machine also are conveniently located on the first floor.